The Steel Industry – Why Scunthorpe? The rise of the Scunthorpe iron industry began with the discovery, or the rediscovery of the early Romano-British workings, of the Frodingham ironstone ore field in 1858-9. The ore bed itself is a lens shape running north-south stretching from the Humber deepening in width around Appleby. Its greatest thickness being near Santon, at about thirty-two feet thinning out to thirteen feet north of West Halton. A particular factor which worked in the favour in the early days was the ores relative ease of mining due to the light sandy soil conditions. 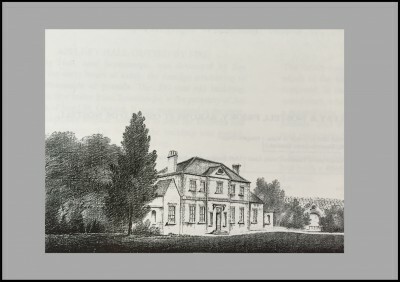 Although various landed families in the area helped to nurture the infant industry, it was the Winn family of Appleby (and Nostell Priory near Wakfield) and especially Rowland Winn, who was the most active in establishing ironmaking at Scunthorpe. After discovery and analysis to prove the quality and quantity of the ore Rowland Winn’s next problem was to find ironmakers prepared to buy it from him. During 1859 and 1860 Winn and a John Roseby, worked to sell the ore. One of the Rotherham ironmasters, probably Samuel Beale who had inspected the mineral in June 1859 had decided to take 500 tons on trial. Two other iron makers, William Henry and George Dawes, also needed ore for their works at Milton and Elsecar, near Barnsley, and they too took quantities of the ironstone on trial. Rowland Winn had divided the Lincolnshire estate into various portions. The Appleby portion he had split into eight lots of about 600 acres each, of which Low Santon was one.. These lots were to stretch from Lord Yarborough’s Santon Wood on the south side, to Elwes’s Roxby land on the north side. Eastwards they terminated on the banks of the Old Ancholme. Winns dream was to was to work the Appleby ore by mining so to encourage this the Scunthorpe East Common ore which required little mining and could be worked on immediately was to be divided into four or five lots of different sizes, and each of these was to be leased with an Appleby lot which was more difficult to mine as the sinking of the necessary shafts would take months and involve great capital outlay. In the end Winn’s desire to work the Appleby stone by mining was to remain only a dream. His first two lessees, the Dawes and Joseph Cliff, were bound by their leases to sink bores at Appleby, but neither worked their stone. Scunthorpe’s development was to depend entirely upon the working of the East Common outcrop ore, and it was to be 1938 before the first underground workings commenced, called appropriately enough Winn’s Ironstone Mine. On 3 November 1859, Winn reached an agreement with the Dawes, who were to take about 650 acres at Low Santon, together with about 270 acres on Scunthorpe East Common. However, difficulties arose with the mortgagors of the Appleby estate, and it was early 1862 before the lease was finally settled. Meanwhile, George Dawes was content to work under the draft agreement. Winn made a further agreement on 16 February 1860, with Samuel Beale who was to take 103 acres in Frodingham under his son’s name, for mining only, furnaces or calcining kilns being forbidden. As with the Dawes’ lease, however, trouble with the mortgagors delayed the final signing. Dawes had begun to work his minerals on 16-17 July 1860, the ore being transported to the Trent in horse-drawn carts. This was a slow business, especially as the roads were often impassable. For this reason, a narrow-gauge track was constructed to take the ore to the top of Brumby Hill. Here, it was off-loaded into carts, drawn down the hill by horses, and then once more loaded onto the track for its journey to the Trentside, where it was put into barges ready for the Dawes’ ironworks at Elseear, Milton and Denby Dale. Later, a self-acting gin was installed so that the full wagons running down the hill could haul the empty ones back up. But before the railway came in 1866, transporting the stone out of the area was a slow, precarious business. It was furnaces that interested Rowland Winn: if the ironmasters erected furnaces in the area, then he knew that the future of his minerals was assured. As early as October 1859, he had been seeking to purchase land on the Trent’s eastern bank, where in his opinion the furnaces would be built. The situation was ideal for water transport to the South Yorkshire coalfield, would have the benefit of his railway which would run close by, and water for the furnaces on hand. The other favoured site was the Ancholme bank, but here Winn already possessed enough land to accommodate the furnace builders. The Dawes were thinking of building there in the spring of 1860. The site finally decided upon was on the cast of Scunthorpe, adjoining the new railway. Here the Dawes built three furnaces, complete with ancillary equipment. Although the works had not been sited on the Trentside the idea was not forgotten, as with a backward glance Dawes named his new plant the Trent Iron Works. The initial charging of the forty foot high furnaces began on 20 January and continued until the 19 February 1864. Precisely when the first iron was cast is not known as the entries in the furnace records arc confused, but by 25 March over 175 tons had been made, and by the middle of April it was noted that ‘hundreds of tons per day of the metal’ were being sent down to the Trent. This was rather an over-statement, but certainly regular consignments were being sent. Winn’s interest in the West Riding and Grimsby Railway had brought him into contact with a Leeds brickmaker, Joseph Cliff. Although Cliff appears to have had no experience in iron matters, he nevertheless negotiated a lease of Winn’s stone, and obtained permission to erect furnaces in the area. Agreement was reached in February 1864 and the lease signed in 11 December 1864. Under its terms, Joseph Cliff and his brother-in-law, William Edward Hirst, were to have ninety-three acres in Scunthorpe and Frodingham, and 300 acres at Appleby. Before signing Cliff had begun to lay out his works on a site near the railway station, just south of the line and east of the Brigg Road in the village of Frodingham it was fitting that the new firm should take the name the Frodingham Iron Company. In July 1864, Winn was approached by a group of Manchester businessmen lead by Daniel Adamson who wished to build two or three furnaces in the area a lease agreement in January 1865. This lease was different from those binding Dawes and Cliff as Adamson was permitted only to build furnaces: his ore had to be purchased from Winn. This was to be the pattern for future ironmakers in the area. Adamson’s furnaces were to be built on a plot of land some distance south of the railway, and east-south-east of Cliff’s works. He began building his first furnace during the summer of 1865, the largest in the area, standing seventy feet high and measuring twenty feet in the bosh, and close-topped. The new company was named the North Lincolnshire Iron Company. It was not however the beginning of a successful run. The furnace drove badly, and after a trouble-ridden campaign, it was blown-out on 16 December 1864. Meanwhile, Trent No. 3 had been put to work in October: No. 2 was not put in until 1867. All the furnaces at Scunthorpe were to be operated on the hot-blast principle. No secondary processing was ever contemplated. Not until steelmaking was adopted in 1890 did the area become any more than a producer of pig-iron. Trent’s output had to be led to the river and sent by barge for further processing. Meanwhile Winn’s interest in the West Riding and Grimsby Railway had brought him into contact with a Leeds brickmaker, Joseph Cliff. Although Cliff appears to have had no experience in iron matters, he nevertheless negotiated a lease of Winn’s stone, and obtained permission to erect furnaces in the area. Agreement was reached on 19 February 1864 and the lease signed on 11 December 1864. Under its terms, Joseph Cliff and his brother-in-law, William Edward Hirst, were to have ninety-three acres in Scunthorpe and Frodingham, and 300 acres at Appleby. Before signing Cliff had begun to lay out his works on a site near the railway station, just south of the line and east of the Brigg Road. Technical advice on furnace construction was obtained from Stockton-on-Tces. Built in the village of Frodingham it was fitting that the new firm should take the name the Frodingham Iron Company. The first two furnaces nearing completion during the spring of 1865, were brick-built with stacks hooped with iron bands, and stood somewhat taller than those of the Trent Works, being sixty-five feet high and measuring eighteen feet in the bosh, as compared with Trent’s fourteen feet. The furnaces were fed from an inclined hoist from the eastern side, the ore and fuel being Joadcd into charging-barrows which were then pushed manually onto the hoist. One of the furnaces was fitted with a charging-bcll to close the furnace top, thereby allowing the gas to be collected for use at the works. Cliffs first furnace was blown-in during May 1865, and during the early days of the campaign the operations were a complete success. The first casts gave a daily make of five tons; later this was increased to twelve tons. With full working a daily output of twenty tons was expected. Like Dawes, Cliff found his first campaign a difficult one, unproductive and expensive. Trent No. 1 had lasted from February to December 1864; Frodmgham’s first furnace blew for only five months, from May to October 1865. Indeed, Frodingham lost one of its furnaces completely in August 1865 when an explosion wrecked the furnace top and blocked the way to the second furnace with bricks and red hot cinders- This was the most serious explosion at the works: other explosions had occurred during the year as the furnacemasters struggled to cope with the variable nature of the ore. Cliff abandoned close-lopped working after this. In July 1864, Winn was approached by a group of Manchester businessmen led by Daniel Adamson, the champions of the Manchester Ship Canal. They wished to build two or three furnaces in the area, and reached an agreement on 1 January 1865. Adamson’s lease was different from those binding Dawes and Cliff. Whereas the latter two mined their own ore, Adamson was permitted only to build furnaces: his ore had to be purchased from Winn. This was to be the pattern for future ironmakcrs in the area. Adamson’s furnaces were to be built on a plot of land some distance south of the railway, and east-south-east of Cliff’s works. He began building his first furnace during the summer of 1865, the largest in the area, standing seventy feet high and measuring twenty feet in the bosh, and close-topped. The new company was named the North Lincolnshire Iron Company. All the firms in the region found the Frodingham ore difficult to work. Like the Trent and Frodingham plants, Adamson’s newly-commissioned furnace suffered similarly in 1866. On 1 September the top twenty feet of the furnace were destroyed: a mass of hot ore and fuel showered the neighbouring buildings, igniting barrels of blasting powder in a nearby store; the works were badly damaged, and production was halted for two months. The experiences had a marked effect upon furnace practice in the area. Both the Frodingham and North Lincoln works had lost close-topped furnaces. The variable nature of the ore and the masters’ inexperience of working it were to make such furnaces ill-favoured in the area for many years. Apart from its high moisture content, the Frodingham stone’s large proportion of lime, required quantities of silica or a silica-bearing material to work it successfully. This was not at first fully appreciated, and the furnaces were often charged with additional amounts of lime, which cooled the hearth, rendering it full of semi-molten material. Neither the slag nor the metal would run off freely, and the hearth had to be cleared using long shovels. By the end of the decade, the lime content of the ore had become well-known, although the Trent Works still used lime from pits near Appleby. Some of the works used quantities of a siliceous clay found nearby at Santon, but the clay’s iron content was very low: a siliceous iron ore was better. Early in 1871, the Frodingham Works had taken some siliceous Northamptonshire ore from Wellingborough to mix with the calcareous Frodingham stone. The mixture worked’ well in the furnaces, and the firm began to receive regular consignments. This led to surveys around and to the south of Lincoln, where beds of the Northamptonshire ironstone were found during 1873-4. Small pits were opened at Washing borough, Coleby and Canwick, but the main source for Scunthorpc was the Mid-Lincoln Company’s pits at Monks Abbey, jusl north of Monks Road, Lincoln, The firm later moved its activities to Greetwell Hollow, These workings were to serve Scunthorpe until well into the twentieth century. 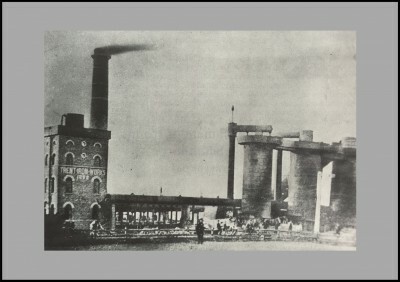 Raw coal was used at the Trent Works at first although by 1869 they were using equal proportions of coal and coke. The Frodingham Works used coke from the start, Cliff purchasing the Patent Coke Ovens at Penistone at the end of 1865. But Durham cokes were long-preferred to nearer but inferior Yorkshire cokes. The ore was all charged in its raw state. Early attempts to calcine the stone in clamps were unsuccessful, since the ore was so limy that on being exposed to the weather, the calcined material fell to powder. Also, the ore tended to melt, even at the low temperatures generated in the clamps. There is no record of calcining kilns being built in the area during the early days, although by 1885 it was thought that the ore would serve if it were charged to the furnace straight from the kilns. A period of expansion occurred at the end of the ‘sixties. Cliff thought of extending his Frodingham Works and of building furnaces on the Aneholme banks, but finally decided to build two more furnaces at Frodingham and to replace his earlier ones with two larger furnaces. John Gjers from Teeside advised on the new plant. The new stacks, sixty-three feet high and eighteen feet in the bosh, were put to work at the end of March 1871. Upon completion of the two new furnaces, the brick-built ones were demolished and replaced by two iron-cased furnaces. A vertical hoist stood between the two pairs of furnaces and served all four stacks. At the Trent Works, too, the ground was cleared for the construction of two marc furnaces, larger than the first three, being sixty feet high by eighteen feet in diameter. Like the earlier ones they were iron-cased and open-topped. They were blown-in about 1875, although no precise dates are available. At Adamson’s North Lincoln Works, the second furnace was finally completed in 1872. Although begun seven years before, operations had been somewhat protracted, possibly because of the experiences with the firm’s first furnace. New firms also began to show an interest in the area. On 10 February 1872, Winn concluded an agreement with a group of businessmen who formed the Lincolnshire Iron Smelting Co. Ltd. This firm was allowed to build two furnaces on a site south of what became Dawcs Lane, between Scunthorpe and the Trent Works. The furnaces were seventy feet high, with bosh diameters of twenty feet. At first both were open-topped, but later one was fitted with a bell. Deliveries of ore began during the early part of November 1873, and the furnaces were set going at the end of that month. 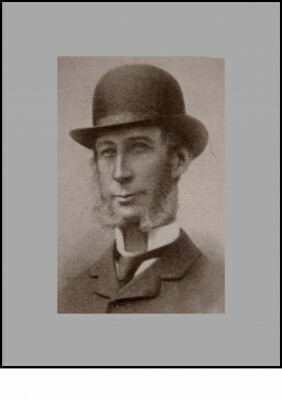 Winn had also been contacted by two other groups of people, the first composed mainly of his friends from Yorkshire, the second made up of Scottish businessmen. On 27 June 1872, the first of these firms was registered as the Redbourn Hill Iron and Coal Co. Ltd. The works took its name, not from the village of Redbourne but from a group of hillocks of reddish sand which were known locally as the Redbum Hills. The company was granted a site for its works on the eastern side of the North Lincoln Company’s furnaces. Here two furnaces were erected, each seventy-five feet high with twenty-foot boshes. They were close-topped, and were the first of such furnaces to be reintroduced into the area since the experiences of the earlier years. The furnaces differed in that the high boshes previously used in Lincolnshire were abandoned, and a furnace more akin to those of 1974 was adopted. The furnaces were blown-in during the early part of 1875. Redbourn had a very close relationship with the Smelting Company from the early 188O’s. In October 1882 the Smelting Company was put into voluntary liquidation, and by the middle of February 1883 the Redbourn Hill Company had purchased its furnaces. It was only after this takeover that the works became known officially as the Lindsey, or North Lindsey Works. The final iron company of the period also started in 1872 by Scottish businessmen led by Blair and Gilmour of Kiimarnock negotiating with Winri for the erection of ironworks. Like the Smelting Company, the firm was one of William Lovell’s promotions. But it was 7 September 1874 before an agreement was finally reached. The firm was to have fifteen acres in Appleby parish upon which two furnaces were to be built, with bosh diameters of no more than twenty-three feet. A further two furnaces were to be built within the first four years. The company was registered on 7 October 1874 under the name of the Appleby Iron Co. Ltd. although locally it was known as the ‘Scotch Company’. It was 1876 before Appleby’s first furnaces were ready for blowing. A planned start in May of that year was not met, and the first furnace was not lit until December. The second was blown-in some little time later. These furnaces were rather small compared to others in the area, being only sixty-two feet high with eighteen foot boshes. Of the original works only Frodingham and Redbourn managed to survive. The Appleby Company was taken over by Frodingham in 1912, and in 1931 the North Lincoln Works which had been sold to Stewarts and Lloyds were purchased by the United Steel Companies Ltd., the parent of the Appleby-Frodingham Steel Company. The Lindsey works were closed by the end of the century and Trent passed to a Leeds solicitor upon Dawes’ bankruptcy in 1887, and then via Firth Brown and John Lysaght to the Appleby-Frodingham Steel Co. who demolished the plant.